After years without a signed contract the Moose Jaw Police have a new contract with the Board of Police Commissioners. The deal which covers the period from January 1st 2016 to December 31st 2020 will see increases to what members of Moose Jaw Police Association (MJPA) are paid. There will be salary adjustments of 2.75% in 2017, 2.25% in 2018, 1.9% in 2019, and 2.5% in 2020. It also offers a resolution to a number of other items. “The Moose Jaw Board of Police Commissioners is pleased to have a successful conclusion to negotiations with the Moose Jaw Police Association,” said Mayor Fraser Tolmie, Chair of the Board. Chief of Police Rick Bourassa offers thanks the negotiation teams for their diligence and commitment to this process. “The negotiation teams participated in a lengthy process that was at times challenging. With this agreement in place, parties can now focus to continue to work together to keep our community safe, harmonious and inclusive,” Bourassa stated. 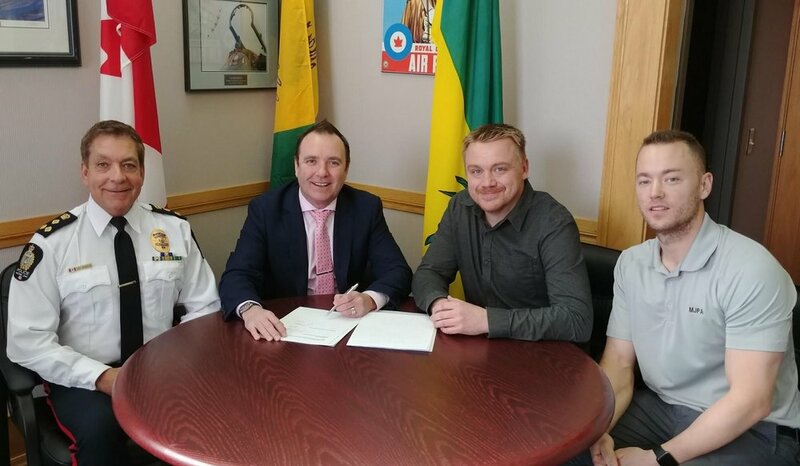 The agreement was signed by Mayor Tolmie and the Moose Jaw Police Association on April 3rd at City Hall.